In today's times it is very difficult to imagine life without computers. Computer technology has invaded our homes, offices, cars and many more utilities of daily living. Hence it is not so surprising that computer technology has made its presence felt in the surgical setting. In the last decade, there has been extensive research in the field of Computer-assisted Total Knee Replacement Surgery. Imagine that if there was even a 3 degree miscalculation in navigation system of the speed boats that landed on the shores of Mumbai on the 26th November 2008, we would have been saved of the gruesome attack. Using the same principle if there is a miscalculation of even 3 degrees of alignment by the surgeon's eye, the implant may be fixed in malalignment, resulting in early failure. 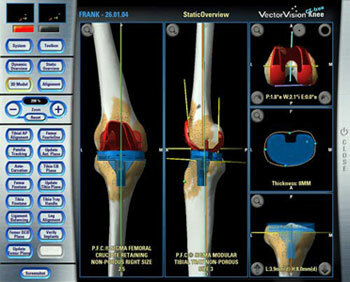 The Computer Navigated Total Knee Replacement Surgery helps to avoid these errors which can occur by the naked eye. 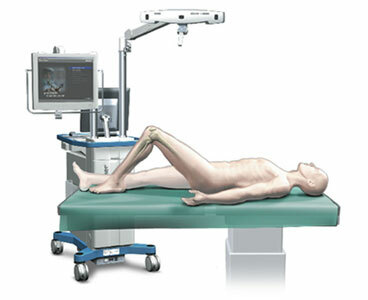 Computer guided system is also called navigation as it guides the surgeon in all the steps of surgery and even points out errors before they are made. Measuring the angle of deformity, assessing the wear and tear of the joint surfaces, making appropriate cuts and balancing of the ligaments can all be done with the help of the navigation system. It guides the Knee Surgeon during all the phases of surgery and points out an error even before it is made. Navigation technology uses special tracking devices, providing the surgeon a comprehensive understanding of your joint mechanics in the operating room (OR). 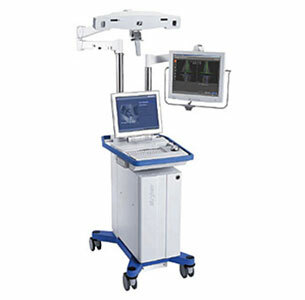 As the surgeon moves an instrument within the joint, special infrared trackers calculate its position and wireless instruments instantaneously transfer the data to a computer. This information is then displayed on a monitor as an interactive model of the anatomy or blueprint that supplies the surgeon with all the angles, lines and measurements of your unique anatomy. The knee surgeon will then replace the diseased bone with new, artificial joint components often called prosthesis or implants. Joint implants are engineered to replicate a normal, healthy joint. With certain techniques, the surgeon may use pins that hold trackers around the incision site of your joint. These temporary placeholders give the computer key information and may make the surgery even more exact, but it does mean that there is a possibility of additional scarring at the pin points. Emerging technologies and alternative techniques may reduce the number of incisions and therefore reduce scarring.